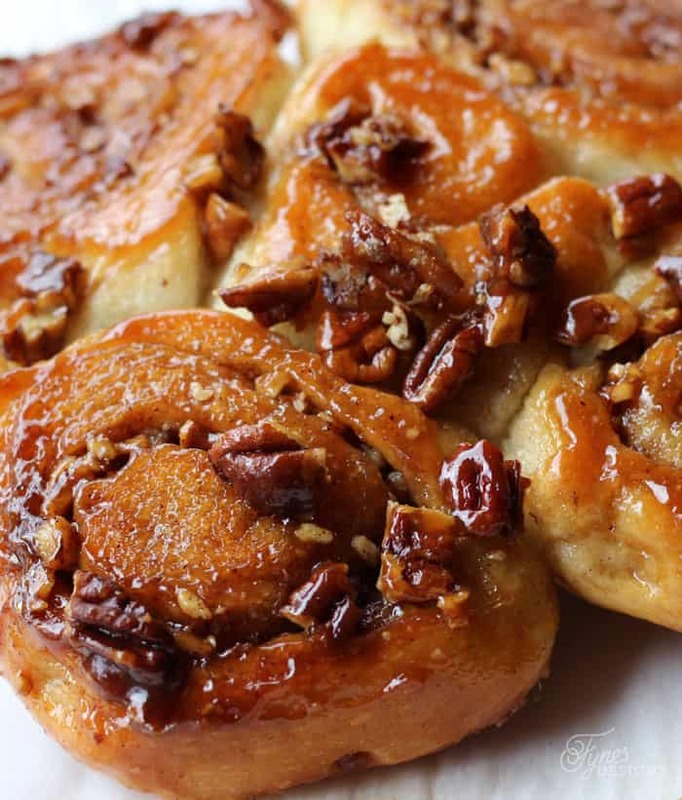 Yum, thats all I have to say after making these delicious Pecan Sticky Buns with my mom over Thanksgiving. They were so delicious, and if you’re already making bread its easy to snitch a little of the dough to whip up a pan of these tasty morsels. I grew up in a farm family, not exactly the kind you think about when you read Little House on the Prairie, but definitely the kind that eats hearty meals when the sun goes down after a long day of work. In our house my mom made bread (plus baked beans and cookies) religiously every weekend to last us the week. Never have I seen her take shortcuts; she always did it the old school way, no bread makers round here. Now that she doesn’t have 6 extra mouths to feed she skips a week or two between baking days, but when I recently got a new Breville 5 Quart Die-Cast Stand Mixer I had to show how leaving a bit of the job up to Mr. Mixer would get the job done quicker, cleaner… and more frequently wink, wink. When I think of using a stand mixer, typically cookies and cakes come to mind, but why not bread if half of the work is omitted?! With the Breville dough hook getting your recipe to come together is a sinch! If you’re not already a bread maker you can check out this Robin Hood white bread recipe here. Can you believe it comes out so perfect! 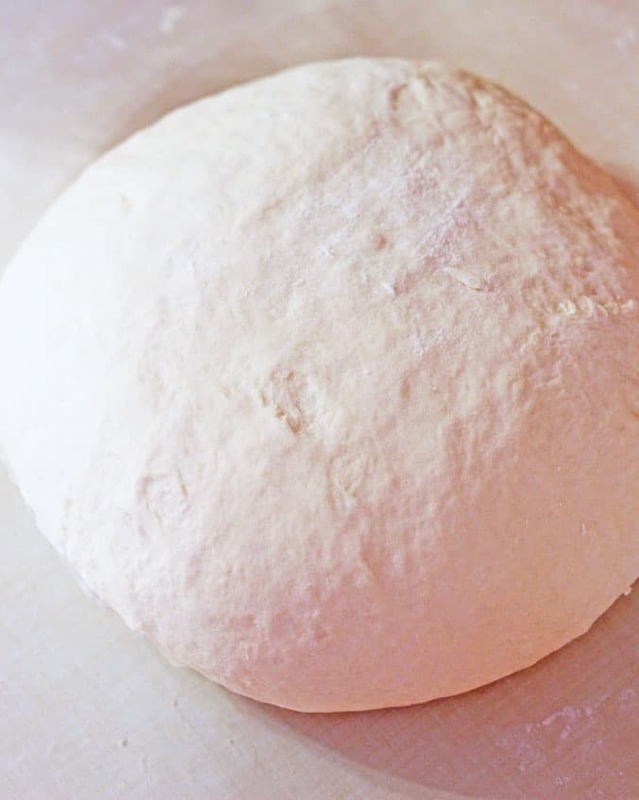 After combining with the mixer, a few kneads of the dough, and a little time to rise, you’re ready to get started. 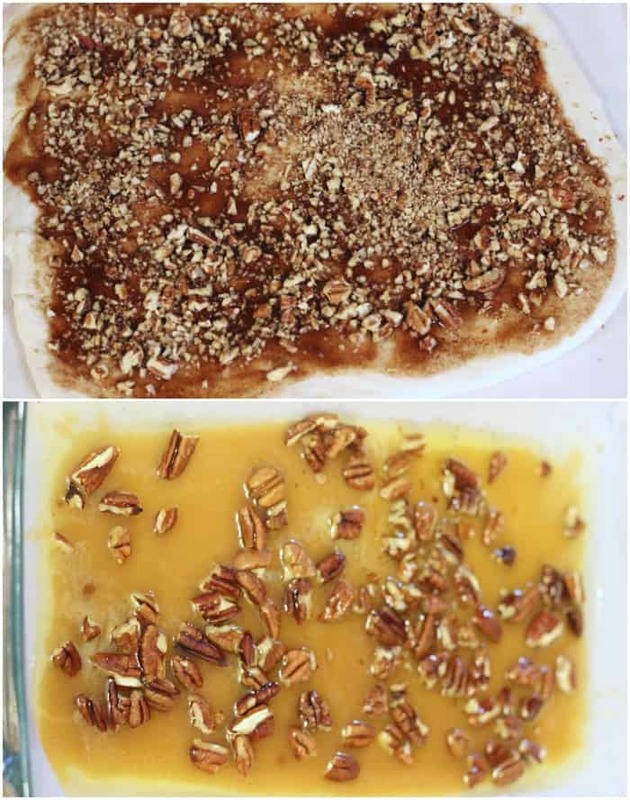 Mix caramel topping ingredients together reserving the pecans. 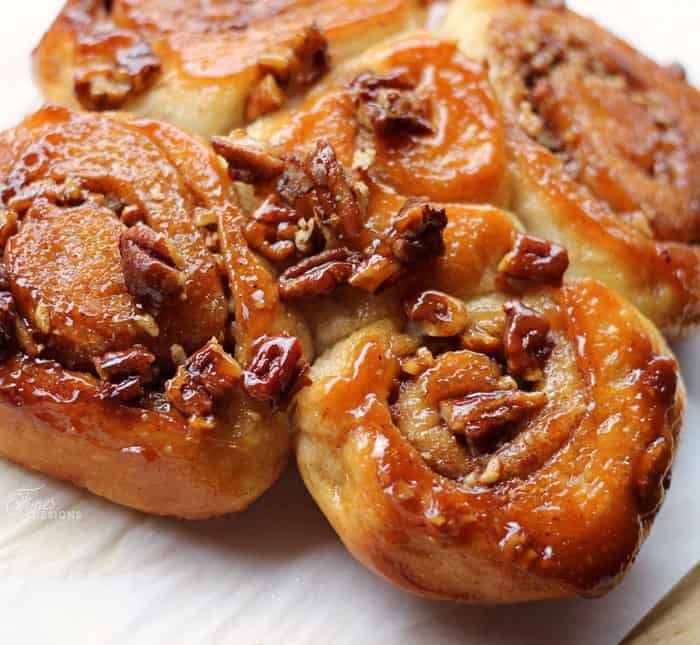 Line a pan with parchment paper and drizzle caramel topping into the pan, and sprinkle with pecans. Roll out bread dough on a lightly flowered surface, flowering your rolling pin as needed. Mix filling brown sugar with cinnamon and nutmeg. Spread butter evenly over the dough, and sprinkle with sugar and spices mixture, add nuts evenly over the top. 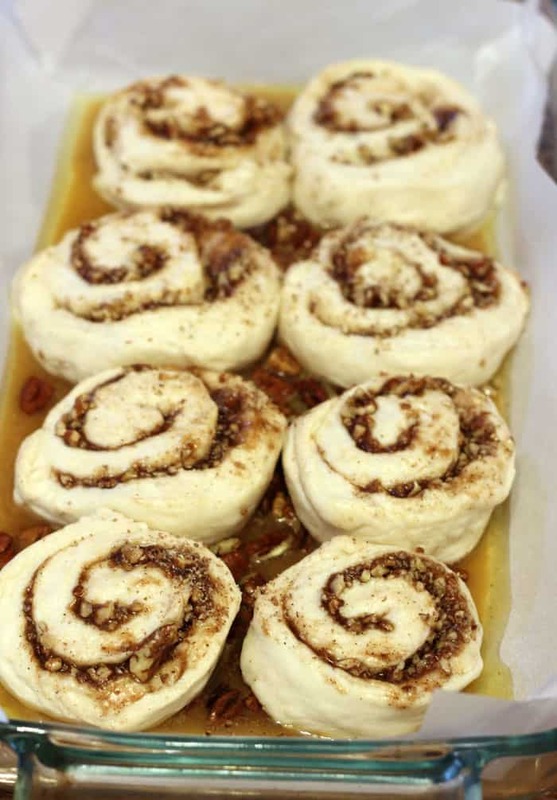 Arrange the buns into the pan with the cut side facing down, onto the caramel topping. Cover with a piece of parchment and a tea towel, and allow to rise until the buns fill the pan. Bake in a preheated 350ºF oven for 25-30mins until golden. Remove from pan and leave upside down. Once the buns are placed in the pan, be sure to let them rise up. When you take them out of the oven, you may be disappointed that they don’t look deliciously gooey as the photos, but once you remove them from the pan, they gooey is on the bottom.. 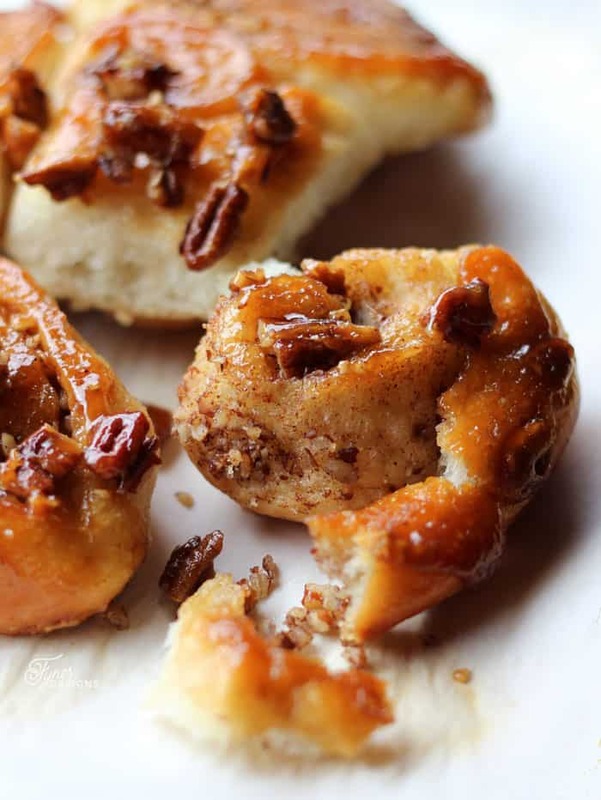 I should have called them upside down pecan sticky buns! Pull the buns apart to serve, best when served warm. Having a second is so tempting! The Breville Mixer made this dough recipe come together so quickly, it has been perfect for all our holiday baking (especially for homemade pizza dough too). Features like the Scraper Beater’s flexible edge scrapes the sides and bottom of the bowl for thorough mixing, not to mention its sleek design. Check out the whole Breville lineup at Breville.ca. I can’ t wait to share more festive treats with you! These look amazing V! 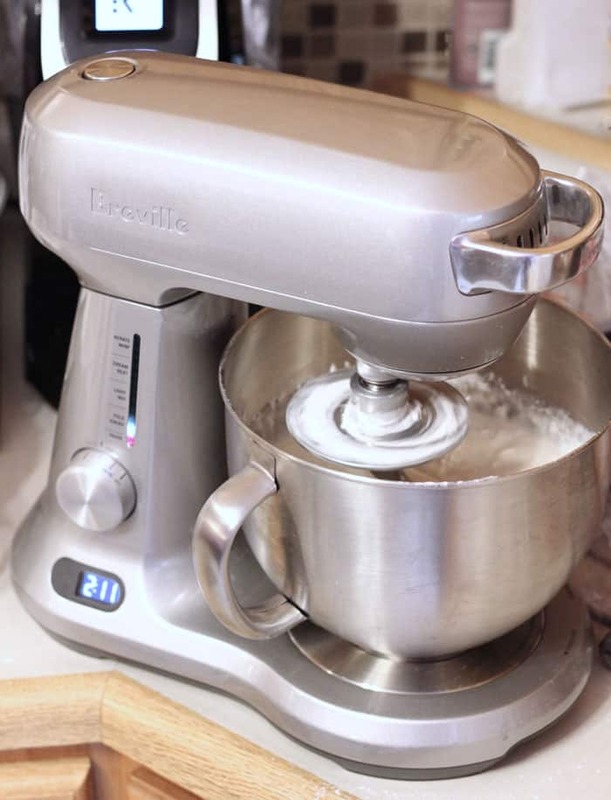 And what a fantastic mixer – I’m loving Breville’s kitchen appliances! Yum! These look so amazing. Pinned so I can try these later this month, they look so good! Thanks for sharing!! Those look so tasty. Great pics. Thanks for sharing with us at #Throwback Thursday. Hope to see you again this week.